*If you are registering as a Team - Please register all participants at the same time. You will have the option to "add attendee" after each participant is entered. Teams will receive a list of clues which will lead them to multiple locations, all within a 1/2 mile radius from the Maquoketa Chamber office.Your team will need to decipher the clues and travel on foot to each "secret" location. At each location you will meet a Chamber Member, who will ask you to complete a team task or challenge in order to fulfill that location's mission. Once you have completed the mission, you're off to the next clue! Teams must stay together at all times and the team captain will be responsible for the list of clues and checklist. Competitive Team Division: All members must be 13 years or older. At least one member of the team will need to be over the age of 18. Anyone under the age of 18 will need to have a parent or guardian sign a waiver of liability in our Chamber Office prior to the day of the race. Family Team Division: There must be at least one member of the team that is 18 or older and at least one member who is 12 years old or younger. Anyone under the age of 18 will need to have a parent or guardian sign a waiver of liability in our Chamber Office prior to the day of the race. NO VEHICLES ALLOWED. The Scavenger Race is a "foot race". Strollers and wheelchairs are permitted for participants who use them in their daily routine. Any other form of transportation will be considered cheating, and your team will be disqualified. 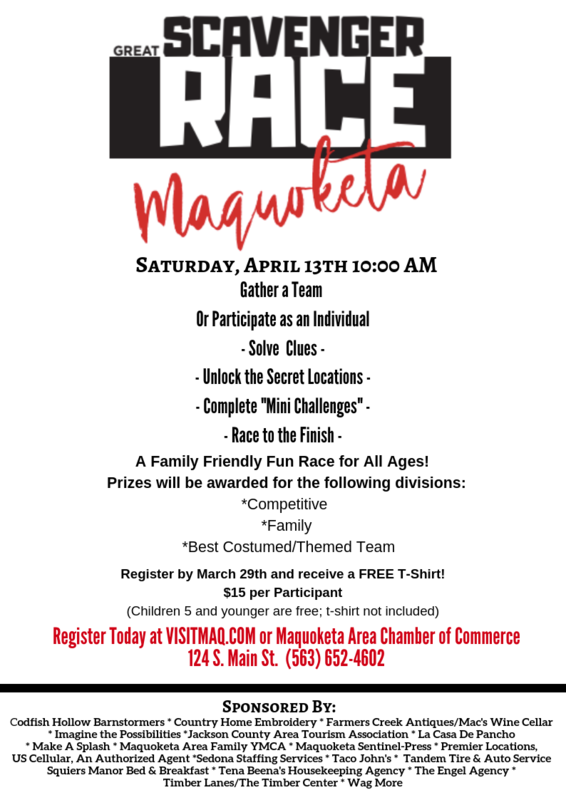 Maquoketa Area Chamber of Commerce, the City of Maquoketa, and the organizers of the Race will not be held responsible for accidents or injuries that take place during the event. There will be no additional traffic control at intersections, and participants are responsible for following the laws for pedestrians. Teams are responsible for their own actions! All team members must stay together during the entire race. Separating is considered cheating, and if other teams report this, you will be disqualified. STAY TOGETHER! Team Photos will be required and taken throughout the race at multiple stops, all members will need to be present. We encourage all teams to have at least one participant with a smart phone, as some of the mini challenges may include having you take and post photos of your team. Our rules allow for you to use your phone as a resource if you get "stumped" and want to use your resources to help solve a clue. Any photos taken during the Race may be used for promotional material in the future. Teams will be asked to sign an agreement at morning check-in to verify they have read and agree to the above rules. $15 per Participant (No charge for children 5 yrs. old and younger). 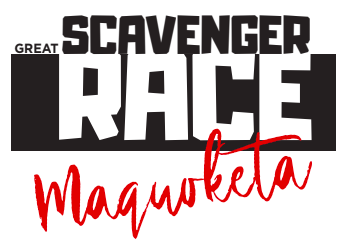 Register by March 29th and receive a free* Great Maquoketa Scavenger Race t-shirt with each participant registration! *Free t-shirt not included for chiildren 5 and younger, but may be purchased separately for $10 each. Register by credit card online, or register and pay by cash at the Maquoketa Chamber office located at 124 S. Main St. Maquoketa, Iowa.